I am hand quilting my "Converging Streets". In each block I am putting two hearts, one smaller than the other. In the lovely light grey sashing, I'd planned to put a rope looking design from a stencil I purchased many years ago. The sashing is 2 inches wide. No matter how well I think I have placed the stencil, it seems to not get centered. I have already ironed the Frixion lines off once, then drew on a couple of leaves that I do not care for. I still have some more hearts to go, so I can work on those while I make up my mind. Any suggestions on something small and uncomplicated that I could put in the sashing? There are thirty blocks so there is a lot of sashing and a border the same size, therefore, I need to really love it. Sorry ribbon candy was a useless suggestion; I missed that you are hand quilting. How about diamond shapes? Last edited by wesing; 05-14-2018 at 05:17 PM. As a hand quilter from years back, l realized stencils are seldom the size you want. Just make a simple template ( cereal box cardboard will do, or plastic dollar store cutting mats), perhaps a pointed oval as in picture. Do the math. Draw one on paper ( fold/ trace) to get halves the same, then cut out paper, trace around to template material and draw a center reference line on the sashings. Use that to center your shapes. I always do the intersections first, then fill in, as you can fudge the fillers a bit without notice. Have you seen these rulers? Check the series for different ideas. I have used them to draw shapes (ropes, leaves, scallops) and then quilt over the lines. The rulers can be used for applique too. There are measurement lines on the rulers so that helps keep it all in alignment. As stitch678 commented, stencils are seldom the size you really need--or they don't trace the exact size. There is something we quilters use called "the fudge factor". Make it work! You may have to adjust the stencil to the size needed--maybe doing the quilting inside or outside the marking will work. Sometimes moving the stencil half a design will work. I usually center the design I want and move from there. And quite honestly, unless you are entering this in a contest of any sort or using it as a wall hanging where scrutiny can happen, once this is on a bed, discrepancies won't be noticed from that famous galloping horse! Your rope design might be more difficult to adjust but the one 'stitch' suggested is easy to utilize for size adjustments. Congratulations on being a hand quilter--very rewarding! Personally, I would just draw a lazy squiggle. 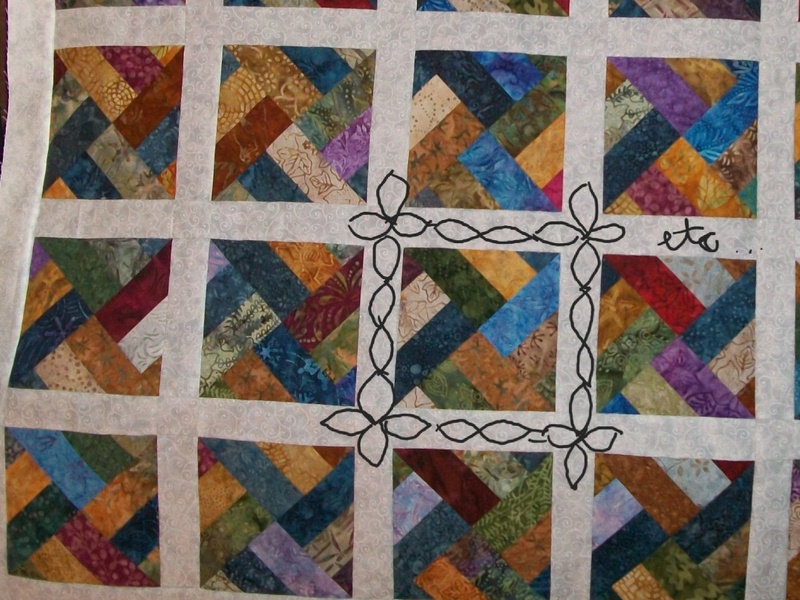 I'm strictly a hand quilter and have done this in the past when I couldn't find stencil that I liked or that would fit. 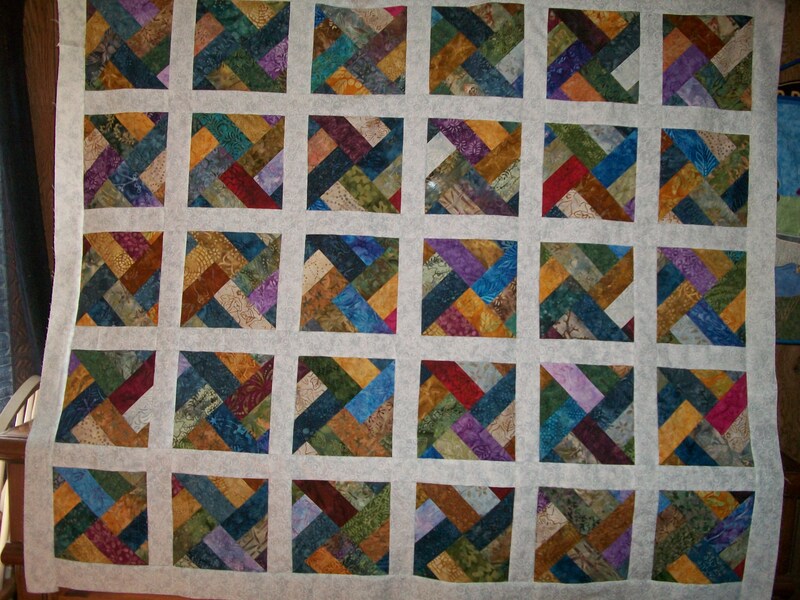 Since your blocks are all straight lines I think adding something a bit curved in the sashing would work really well. Look at the pattern called egg and dart. You might like it.